ADATA has a very broad portfolio of consumer NVMe SSDs, featuring most of the controller solutions available on the open market. Not all of these have been particularly successful, but the most recently released drives use a formula that has been working well for several other players in the SSD market: Silicon Motion's SM2262 controller combined with Intel/Micron 64-layer 3D TLC NAND flash memory. 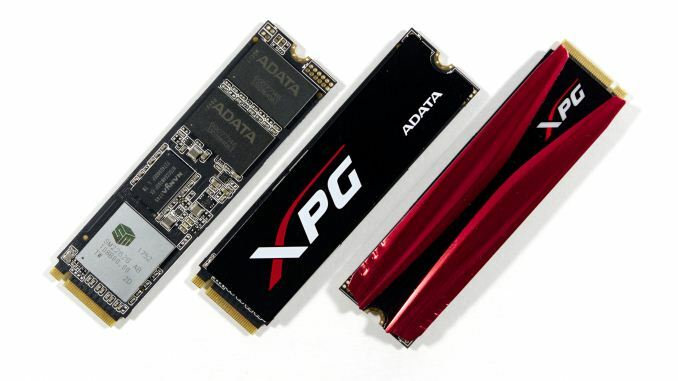 The ADATA XPG SX8200 and GAMMIX S11 SSDs differ primarily in branding and the design of their heatspreaders, but underneath they both feature the same SSD architecture that we've found makes for a great combination of high performance and reasonable prices. The SX8200 and GAMMIX S11 replace several older ADATA SSDs that used Silicon Motion's first NVMe SSD controller, the SM2260. The XPG SX8000 paired that controller with Micron's 32-layer 3D MLC NAND, while the XPG SX7000 and GAMMIX S10 used Micron's 32-layer 3D TLC NAND. Those first-generation NVMe drives from ADATA suffered from the limitations of the SM2260 controller and the first-generation 3D NAND from Intel and Micron. As a result, even the use of MLC NAND in the SX8000 couldn't enable it to reach the performance of good TLC-based SSDs like the Samsung 960 EVO. The SX7000 and GAMMIX S10 were even worse off and despite ADATA's branding (and pricing) them like high-end SSDs, they were among the slowest NVMe SSDs on the market and could not reliably outperform mainstream SATA SSDs. ADATA has also released or announced several other consumer NVMe SSDs that aren't included in the chart above. The SX6000 and SX7100 use Realtek controllers and the SX9000 uses a Marvell controller. The Silicon Motion-based drives occupy the middle of the lineup and are the most popular and widely available NVMe drives from ADATA. This year, most of the SSD industry is working with 64-layer 3D NAND (almost exclusively TLC NAND), and there's no clear winner or loser in raw NAND performance this time around. Silicon Motion's second-generation NVMe controllers are capable of delivering far higher performance than the disappointing SM2260, and the market for high-end SSDs is no longer dominated exclusively by Samsung. Intel was first to market with the SM2262 controller in the 760p SSD, which features some Intel-specific customizations to the Silicon Motion reference design. The ADATA XPG SX8200 and GAMMIX S11 are much closer to the reference design, but use NAND that has been binned and packaged by ADATA, and come with ADATA's own heatspreader designs. The other SM2262 drive we've reviewed is the 1TB HP EX920. Compared to the EX920, the ADATA drives have lower usable capacities due to reserving more spare area, which usually improves sustained write performance. Today's review focuses on 240GB and 480GB models from ADATA, which gives us a chance to see what performance is like at the more affordable end of the product line. We can also compare the performance of the SX8200 with no heatspreader against the GAMMIX S11 with a heatspreader (and with slightly newer firmware). Spoiler: those differences never matter to real-world usage. For all practical purposes, the SX8200 and GAMMIX S11 are just cosmetically different. ADATA's performance specifications for the SX8200 and GAMMIX S11 show that the 240GB models are significantly handicapped for all access patterns other than sequential reads. Even so, that smallest SX8200 is rated to easily outperform the largest and fastest model from the preceding SX8000 family. With the move to higher-density 3D NAND, ADATA has dropped the 128GB capacities from the lineup. Performance at that capacity would be even lower than what the 240GB models provide, and would no longer be reasonable for a high-end NVMe SSD. ADATA's low-end SX7100 series is planned to retain a 120GB option. 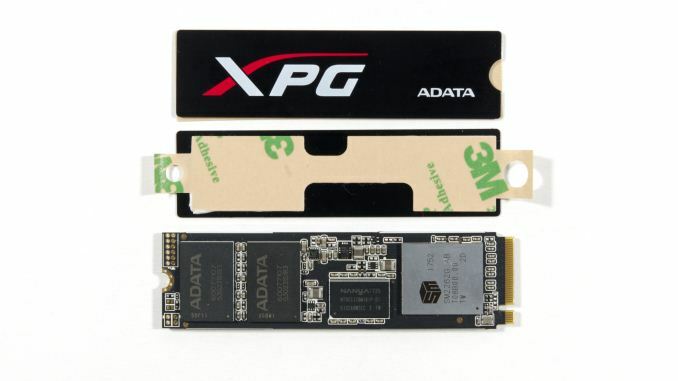 ADATA has not yet brought a 2TB M.2 NVMe SSD to market, but they are prepared to extend the SX8200 family to a 1.92TB (usable capacity) model. Write endurance for the SX8200 and GAMMIX S11 is rated for a little over the typical 0.3 drive writes per day, and the five year warranty period is standard for high-end SSDs. The PCB used by the SX8200 and GAMMIX S11 has components on both sides at all capacities, so even without the heatspreaders these drives won't fit into every notebook computer. The ADATA XPG GAMMIX S11 comes with the same two-tone textured heatspreader that was used on the GAMMIX S10. The thermal pads anchor the red parts of the heatspreader to the chips below while the black recessed area does not make contact with the drive. The ADATA XPG SX8200 comes with a flat black heatspreader ready to be installed and a thermal pad that makes full contact with the controller, DRAM and NAND packages on the top side of the drive. For this review, the SX8200s were tested without the heatspreaders installed. An assortment of Samsung NVMe SSDs that generally represent the gold standard for high-performance high-price SSDs. The Intel Optane SSD 900P and 800P, the most expensive consumer SSDs, with absolutely unbeatable performance in some areas, but not the fastest in every category. The Intel SSD 760p, very similar to the SX8200 or HP EX920 save for some customizations that Intel hasn't detailed. The second-generation Western Digital WD Black, a top of the line TLC-based SSD with a new in-house controller that poses the most direct threat Samsung's 9x0 EVO SSDs have faced so far. Thank you. This helped me avoid two different mistakes buying an M.2 for an Asrock x370 Taichi, All of the nonworking Adata's are on the QVL, along with the 8200 that works. The 8200 read speed is comparable to Samsung, but the write speed is about half as fast as Samsung. For the cost the 8200 is much more affordable for PCIe 3.0 nvme 1.3. So now what to do...a few years ago, B+M M.2 Sata was pretty standard. PCIe was Samsung only and cost too much. Now M.2 is in transition and not so easy.